Flex Veda is a supplement that provides a preventive measure against certain joints spasms and elasticity problems in the near future. It does this by protecting your joints and hence promoting overall joint mobility. With this said, it’s a supplement that is created with muscle building minerals as well as patented bone that make up ingredients that will revive your hair, skin, and nail growth. And that’s why it’s referred to as joint optimizer as well as fast-absorbing collagen bone supplement that defies age. The manufacturer claims that this supplement is designed to restore both flexibility and mobility that are needed for healthy joints. Who is the Manufacturer of Flex Veda? The company behind this product is known as Nariveda, which is a reputable liquid plant-based elixir. It claims to care more about the mindfulness as well as the whole-body wellness of all its customers even before they release any product. The company was founded by a father and a son who had foreseen the need to come up with something to strengthen bones joints and muscles. The manufacturer has an Indian-based origin and claims to use a quality ingredients for their products. It has a well-established website where you can find all the information about their products and order online. How Does Flex Veda Work? Between the age of 25-30, that’s when the balance between bone formation and bone loss fluctuates gradually with time, and this can weaken your bones. Once you take this supplement, it has active ingredients that work at the cellular level to bring back elasticity and cell membrane fluidity which will offer support to joint movements like walking and bending. So, if you want to maintain a healthy skeleton system, then consider taking this supplement since it might promote bone density development. It will nourish your body by offering bone density development, joint lubrication, proper cartilage formation, and healthy inflammatory response. 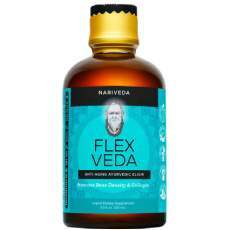 Flex Veda Ingredients – Are they Safe & Effective? This product has active ingredients like Fruitex-B and Sustamine that work together with other elements to provide you with strong bones and muscles. The manufacturer claims that this product has over 105 ingredients, and we will be looking at the main ones. Vegetarian Omega-3 – This is an ingredient that might lower the risks of chronic diseases as well as reduces inflammation. It also enhances bone mineral content, and it’s a vital constituent for bone marrow. Sustamine – It’s another ingredient that is very effective in rehydration and muscle recovery thus ideal for sports performance. Regenasure – It helps a lot in healthy aging of the body joints. Fruitex-B – It provides support to certain conditions that can be as a result of inflammation. Optimsm – Another ingredient that is a source of sulfur that is found in bones, muscles, and skin. Clarinol Cla – It might promote natural fat metabolism process in the body thus getting into shape quickly. Curcumin – It inhibits destructive enzymes that can lead to muscle breakdown and helps in the regeneration of bone tissue. Boswellia – This ingredient supports joint health and mobility. What are the Advantages of Flex Veda? The product replenishes your skeletal system with minerals. It keeps your joints healthy since it has powerful antioxidants. The product might promote skin elasticity thus improving your skin appearance. It helps in the buildup of lean muscles and replenishes collagen. It has a well-established website where you can access all its information and order it online. What are the Disadvantages of Flex Veda? You may be required to regularly consume it for months before you can notice any signs. The manufacturer does not allow returns, but in particular cases, they may reconsider a return policy. The Product has over 105 ingredients, and thus users need to make sure to check about the sensitivity of the elements. It requires refrigeration after the first use. A cancellation order comes at a price, and you can pay 15%of the fee as the cancellation and restocking fees. It’s a liquid supplement and may not be ideal for people who prefer taking capsules. It’s a new product thus there are fewer reviews about it online for new users. How Should You Take Flex Veda? You need to shake the bottle very well first, and then you can mix one teaspoon with water, juice or shake. Drink it straight, or you can swish in your mouth for few minutes before swallowing. The manufacturer recommends that you take it twice in a day. How Much Does Flex Veda Cost? The product retails for $89.95 on its official website, where you can order it. The company allows its users to use a coupon code, if you have any, as a discount on the product. What is Flex Veda’s Return Policy? There is no information on the official website that suggests that this product has a valid return policy. However, the company claims to listen to some circumstances that may arise but clearly states that shipping fee is not refundable. Does Flex Veda Offer a Free Trial? There is no free trial for this product. For you to check its effectiveness, you may be required to purchase it. However, you can be checking the official website for any updates on free trials. By taking this product on a regular basis for people in the mid-life stages, it might nutritionally promote joint mobility as well as protect your joints, muscles, and tendons. Thus, you will be able to maintain an active life that gives you a chance to travel and enjoy life for years without bone or muscle problems. The product has about 105 ingredients, and thus before consuming it, check whether it’s completely safe from allergies or sensitivities. The product requires refrigeration after the first use. Also, be sure to note that after buying the product, a cancellation order is not free. You will pay about 15% of the total amount as the cancellation and restocking fee. All in all, if you are not satisfied with the notable results after consuming this product, then at your free will you can check out other Joint pain relief products that offer the same benefits.